Novo Nordisk has published its integrated 2018 Annual Report detailing the company’s year-end performance. The report highlights the company’s progression towards long-term targets taking an integrated approach that accounts for financial, social and environmental performance. This is the company’s 15th integrated report. The Management Review details the company’s purpose, strategy, priorities and achievements, including information on Novo Nordisk’s approach to corporate governance and board diversity, share and capital structure, remuneration, and risks and opportunities related to social and environmental dimensions. Over the years, Novo Nordisk has demonstrated its ability to deliver competitive profits by remaining focused on delivering on its purpose. 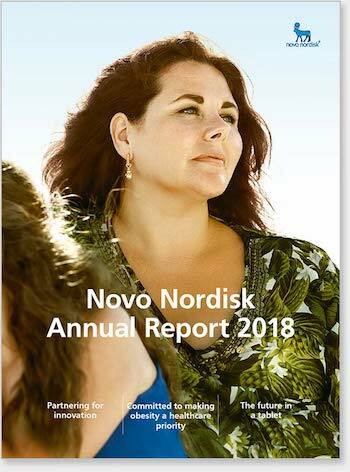 Throughout the Annual Report there are examples of how Novo Nordisk creates value to patients and to shareholders, actions taken to demonstrate responsible business conduct. With a clear ambition to be a sustainable business, actions in 2018 have strengthened the platform for sustainable growth. Operating profit decreased by 4% in Danish kroner and increased by 3% in local currencies to DKK 47.2 billion, impacted by the depreciation of the US dollar and related currencies versus the Danish krone. Novo Nordisk provided medical treatment to an estimated 29.2 million people with diabetes, of whom 5.5 million were treated with insulin for on average USD 0.12 per day or less, which is the guaranteed ceiling price for human insulin sold under the company’s Access to Insulin Commitment. In 2018 the scope of the guarantee was expanded and now covers a total of 78 countries, home of 124 million people with diabetes, as well as selected humanitarian organisations. Novo Nordisk updated and expanded its Business Ethics Code of Conduct to incorporate the company’s commitment to respect human rights as set out in the UN Guiding Principles on Business and Human Rights. Novo Nordisk is well on track to achieve its goal of 100% renewable power from production. By the end of 2018, 77% of all power for Novo Nordisk’s global production is from renewable sources. As of 2018, Novo Nordisk has expanded the scope of CO2 emissions beyond production and product distribution, and now reports on the company’s global CO2 emissions from offices, laboratories, company cars and business flights, which amounted to 269,000 tons, of which 114,000 tons were from operations. A new target has been set, committing to zero CO2 emissions from operations and transportation by 2030. This is part of a new ambition to have zero environmental impact from the company’s operations by 2030.